Leave it to Japan to take bicycle parking to the next level. And by next level we mean multiple levels. Underground levels. 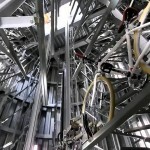 This automated bike parking system looks straight out of the Matrix. Except with more emotion than Keanu Reeves- zing!